The beach resort of Woodgate is situated 38 kilometers off the highway along Goodwood and Woodgate Roads. The area boasts a magnificent long white sand beach with the first surf north of the Sunshine Coast. Prolific numbers of birds including emus, brolgas and jabiru together with kangaroos, wallabies, echidnas, possums and reptiles inhabit the national park and surrounding areas. The many walking tracks area a great way to discover the flora and fauna of the Woodgate National Park. Walks range from the 200 metre boardwalk through a tea tree swamp to the 6.2 kilometre Banksia track. There are some facilities for wheelchair access. Camping is also allowed in the park however access is only by four wheel drive vehicle. A bird hide on the edge of a shallow lake provides an excellent bird viewing facility. Vegetation ranges from the wallum heath with its spectacular spring wild flower displays to the mangroves and water lilies of the swamps and saltpans. Accommodation is designed with the holiday maker in mind. The bowling club is popular with locals and visitors. Woodgate is a wonderful place for a family holiday with many people returning yearly. 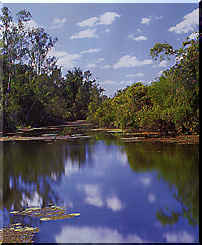 On the way back from Woodgate to Bundaberg you can stop at Coonarr and Kinkuna National Park. The national park is undeveloped so visitors have to be self sufficient even to water supplies.